The Feds recently shut down a huge, private gambling pool. They confiscated nearly $2.5 million from the two gentlemen who ran it and its now, pretty-pissed off participants. The gambling ring in question was an eliminator/suicide style pool called Ron & Mike’s. It was one of the biggest in the nation, or at least the biggest we’ve heard of to date. Those of you who gamble on football probably know what an Eliminator or Suicide pool is but for those of you who don’t, here goes. Stick with me here as I promise this story has a happy ending, much happier than for those whose entry fees were so rudely confiscated by the good old US of A.
Eliminator pools are specific to the NFL season. To enter, you pay an initial fee, whether it be $20, $30, $50 or what have you. Each week prior to the pool’s deadline, usually right before kick-off of the Thursday night game, you pick one team based on who you think will win that week. There are no point spreads; all you have to do is pick one winner which I promise you is easier said than done. If the team you picked wins, you advance to the next week. If the team you choose loses, you are done for the season. There goes your entry fee, ideally not into the hands of federal agents but to a participant who successfully outlasted you with his picks. Generally speaking, in said pools, you are not allowed to pick the same team twice in a season. Therein lies the strategy. Whoever hosts these pools set the rules. Quite often, it’s winner take all. I’ve participated in said pools, theoretically speaking of course, for the past ten or so seasons and have made it close only once. Far more often, I’ve been bounced in the first week. To be clear, I would never condone dubious behavior such as irresponsible and illegal sports gambling but, assuming I did, I remember that one pool as if it were yesterday. I chose the high-falutin’ Rams against the then lowly Jaguars who ended up upsetting them on the road. It seemed like a no-brainer pick at the time, however, as any seasoned gambler will tell you, there is no such thing as a sure thing. In short, eliminator pools are a fun way to pass the time, however, the longer you get into the season, the more you sweat each pick knowing that an increasing amount of money is on the line… or so I’ve been told by the heathens who enter such pools. Please keep in mind, as with any sports gambling, unless you are in Las Vegas, these endeavors are illegal. I entered three eliminator pools this year, as I do every year, again theoretically speaking. At this point it time, it is best to understand that this post is purely a work fiction which is why I have such a new-found respect for Jay Cutler. After all, no one would ever believe a story that involves Jay Cutler winning you money. Said fictional pool of note would pay out top ten places with the overall winner taking nine thousand dollars… in Monopoly money, small stakes compared to the monster pay out of Ron & Mike’s but still not at bad season at the office for successfully logging consecutive weeks of educated guesses. I’ve criticized Cutler in the past. Who amongst us hasn’t? From here on out, however, he is my favorite quarterback of all-time. He will most definitely be receiving a fancy, glittery Christmas card from yours truly. After all, now, I can afford it, as long as Hallmark accept counterfeit bills. Let it be known that I was faring pretty well in this hypothetical pool. As the weeks whittled down, the number of remaining participants decreased as the picks became more challenging and most certainly more nerve-wracking. Again, as any seasoned gambler will tell you, double-digit favorites are no sure thing. Just ask anyone who wagered on the Patriots in Week 14. With a scant few, let’s say 16 or so, people remaining in the pool, 12 had sided with New England over Miami. The legendary Patriots lost that evening to Jay Cutler and his merry band of Dolphins eliminating 75% of the remaining participants, excluding of course, yours truly, in theory, who stayed away from the Patriots on the road opting for a far more logical win: the San Diego Chargers hosting the Washington Redskins. 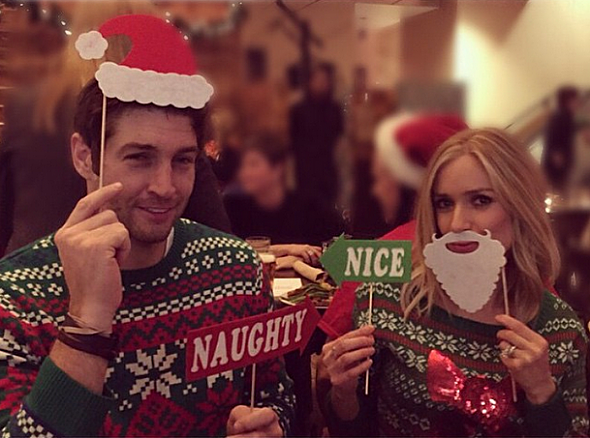 So, to Mr. Cutler, I hereby wish you the happiest of holidays. Look for me at an Irish pub near you. I’ll be the one buying the cocktails and telling fabricated stories of how I won a pool that didn’t exist. This entry was posted in Featured, Life of Sports Chump, Pigskin, Sportsbook and tagged Jay Cutler, Miami Dolphins, New England Patriots, Sportsbook by Chris Humpherys. Bookmark the permalink. Jay Cutler remains inconsistent and overpaid. One win , once in a blue moon , even if it’s helping a bet placed . I’d rather knock boots with his wife than watch Jay play ! Out here in the desert we call them “Last Man Standing” contests. There is strategy to be applied to the selections. I think you got the right idea. Now for the ‘lackadaisical look’ Cutler…Many of his past and current teammates have attested for his fortitude despite cheap shots by the media. The guy is in a win-win situation. A 7 figure contract, only current competition Matt Moore, but most importantly W or L look at the trophy wife he goes home to. Pretty sure I could find some on the discount rack even though now I can afford to buy ’em full price. The Dolphins were in a desperate spot thanks to the Tannehill injury hence the extra ten mil Cutler will take into retirement. I wonder what the odds are of him being on team next year especially considering teams know he’ll answer his phone. Most of us remember that Cutler almost single-handedly beat the Gators while at Vandy. Of course that was back in the day when Vandy never beat Florida. You know, the good old the days. Ah yes, Mony. I remember that one well. Fortunately this hypothetical win will allow me to come back and defend my throne for years to come. So the odds he’s on an NFL team next season are…? Congrats on the win Chump. Cuntler, for all his shortcomings, failings and completed passes to the opposition on the field, certainly is winning off of it. Hot wife, huge contracts, low expectations and a bright future as winner of the “What would Tim Tebow look like as a methhead” contest. Pick-em on Cutler’s NFL future. If he can cover the large impost @Arrowhead next week & somehow beat Buffalo with divine intervention the following, Matt Moore might need a passport to the CFL. This assuming Tanneyhill is healthy. The only call Cutler might now get is one either from the US Census Bureau or from a charitable foundation looking for a monetary donation. Your thoughts on the debate now taking place , where suggestions are being made that the Kobe Shaq combination was by far the best there has been in Los Angeles Lakers’ history ? To me that is a big sleight to the combos such as Magic./ Kareem and countless others in the franchise’s history. I guess the ones behind this whole don’t really know the history of the Lakers to begin with ? I think you nailed it right on the head. And congratulations for being the first person to ever utter “Tebow” and “methhead” in the same sentence. Meanwhile, in Jacksonville, they’re celebrating the best NFL team in the state. If you tally Magic and Kareem’s combined league MVPs (9) to Shaq and Kobe’s (2), I think you’ll find the latter duo falls well short. Lifestyles of the promiscuous athletes, huh, boys and girls. Cutler for MVP. Fins up!